In this widget you can display your WooCommerce products combined with a category image and with the option of displaying the amount of products in every category. This is especially useful for a Home Page in which you would like to display all your store’s main categories in one place. Title: Here you can place the title that would be shown above the list of categories. 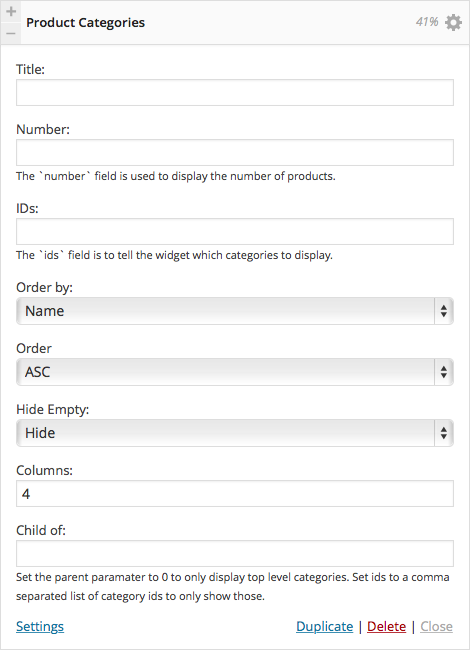 Number: Set the number of categories to be displayed in the page. IDs: This field updates what categories will be displayed in the widget, you can set a few categories and separate them with commas. Order By: Set the order in which you’d like the gallery to be displayed. By name, slug, count, none or ID. Hide Empty: Choose whether to show or hide an category with no products. Child of: The parameter must be set to 0 to display only the main categories. Or you can set the IDs (separated by commas) of the relevant categories to display their child categories.